The Lackawanna Longnecks are an Old Time stringband from Pittsburgh, Pa. They have committed themselves to play music in the style of the Old Time Appalachian tradition. Since 1987, their full acoustic stringband sound has been heard at concerts, square dances, parties and jams around Pittsburgh. 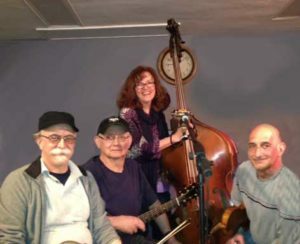 Band members are: Frank Falvo – fiddle, Mike Reing – guitar, Mark Tamsula – banjo, and Jean Getz – bass. Wherever they perform,… there they are!